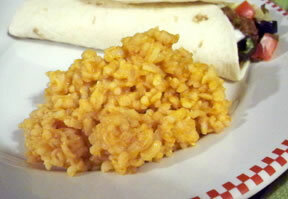 A delicious side dish for any dish, especially a Mexican inspired one. 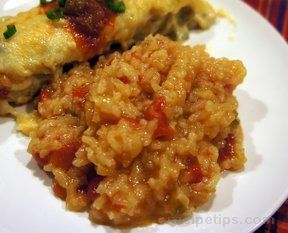 Perfect with burritos or enchiladas. 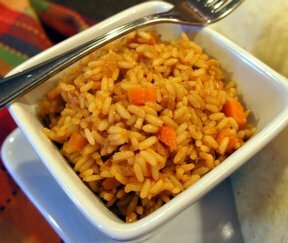 The tomato sauce and bouillon add just the right touch to plain white rice. Heat oil in large skillet on medium-high; add rice and fry until light brown. Remove pan from heat to prevent burning. Add water, tomato sauce and bouillon; bring to a boil. Reduce heat to low, cover and simmer for 20 minutes until all the liquid is absorbed. 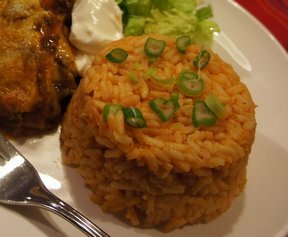 "Good Mexican rice and simple to make. I added green pepper in with the rice for a little extra flavor and color. Cilantro would be really good in this, too."